Wye is blessed with an extensive network of local footpaths and bridleways, which radiate in every direction into the surrounding countryside. These paths connect to a waymarked National Trail and and a Long Distance path, which pass through the village. This network reflects its importance as a local centre since pre-Roman times. To help you explore these rights of way Kent County Council provides a detailed online map of trails, footpaths and bridleways, which you can find on this link. 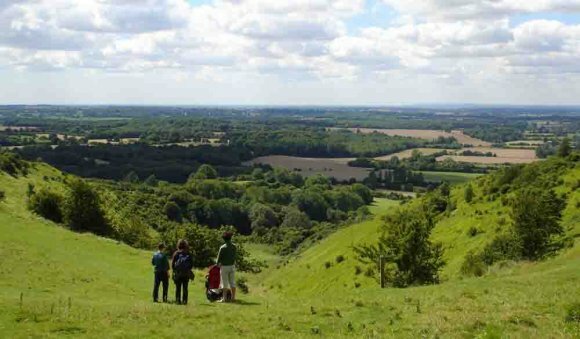 The Kent Downs AONB Unit recommends the Devil's Kneading Trough Wye TN25 5HE for its dramatic views and chalk scarp landform, and the long-distance panorama across the whole of Kent. You can download an illustrated walk guide and map here. "Enjoy stunning views from this dramatic site over the Romney Marsh and Weald and out to the English Channel. Why not have a picnic, fly a kite or enjoy the wealth of wildlife and catch a glimpse of rare species of orchid and butterfly." "The Devil's Kneading Trough is part of the Wye National Nature Reserve owned and managed by Natural England. The chalk grassland is renowned for the range of orchids it supports; 21 species have been recorded at the site including lady orchid, fly orchid and the rare late and early spider orchid and man orchid. The dramatic coombe is managed for wildlife by grazing by hardy British White cattle. This helps to maintain the grassland in such a way as to create an ideal habitat for many insect and flower species species. 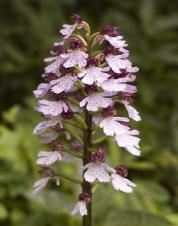 As well as grassland the reserve includes areas of scrub, woodland and over 3.5 km of hedgerows. These habitats support around 50 breeding bird species including nightingale, hawfinch, lesser spotted woodpecker and kestrel. Reptiles found here include adder, grass snake, slow worm and common lizard. There is a 4 km nature trail through the reserve (steep in places) and leaflets and signs are available at the Visitors' Centre." For further information please visit Natural England's report on Kent's National Nature Reserves. The 153 mile North Downs Way National Trail (Farnham to Canterbury), and the 61 mile National Cycle Route 18, (Canterbury to Tunbridge Wells) and the 51 mile Stour Valley Walk (Lenham to Pegwell Bay) Long Distance Path, all intersect at Wye church. Wye News has a selection of OS maps, and local guides for walkers, at 38 Church Street, Wye, Ashford TN25 5BL. Phone: 01233 812271. The shop opens six days a week, and on Sunday mornings.